It was decreed that all expendable office staff (i.e. me and Annie) should spend Friday digging test units with the Historic Crew (reduced to a skeleton: Katie and Wes). So, Friday morning, quarter past five, I'm up. Two hours before the sun. An hour on the subway followed by the light rail, and then another hour by crew van and we're there. A farmer's field of deeply furrowed clay soil, soon to be another subdivision or industrial park or whatever. This was a cool little find: a coin marked with the year 1812. Wow, 1812 is pretty early for Canada, right? Well, the story's a little more complex. 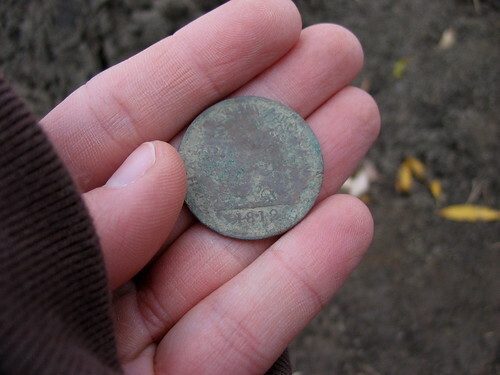 Apparently, this is a Tiffen half-penny token which was made around 1832 but with a fake date! 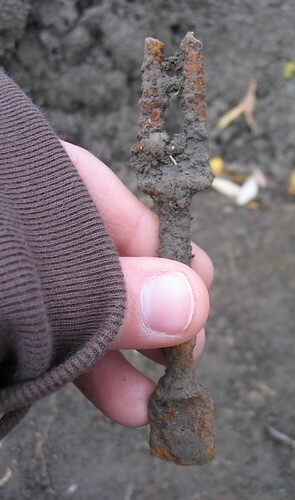 Here's a wacky two pronged fork. "That's because they had fewer teeth back then." Hmmm, not sure if I buy that explanation... I'm told this kind of utensil would have had a bone handle. 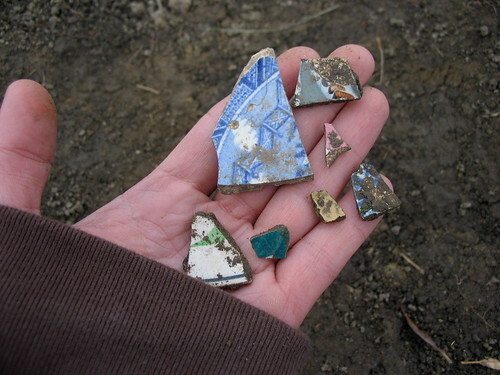 Some examples of the different kinds of ceramic sherds found. The 1 metre by 1 metre test units had up to 150 sherds in them. That's Annie on the left and me on the right, toiling away. 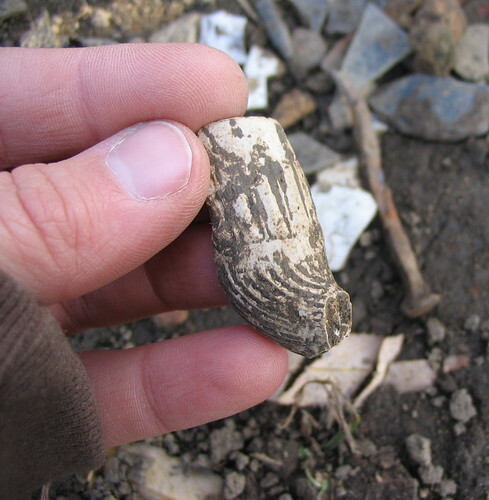 The site was an old school house, so there were plenty of pieces of slate tablets, slate pencils and ceramic ink bottles found. 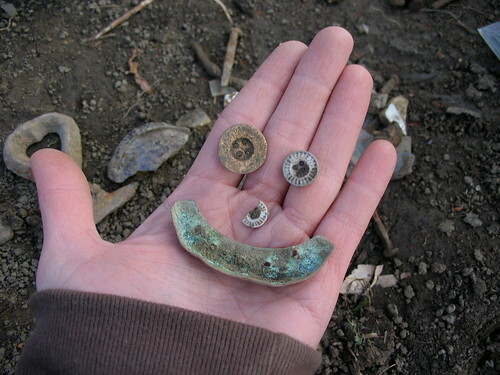 Here are a few buttons plus a metal toe cover from someone's shoe. I bet it got pulled off by the horrible sticky clay soil in this field. looks like a fun day at the 'office'! What I find fascinating: not sure who's hand is holding those items but I can make out their fingerprints! So either you have a really good camera or that person's fingers has deep ridges! either way, it is cool. That would be my hand - kinda wrinkly from being in the cold, damp weather all day. I think that my fingerprints are very visible because my hands were dusty, too.